"Charging a man with murder here was like handing out speeding tickets at the Indy 500." The rules of war. Can there be a more absurd or contradictory concept? Think about it for a moment – two opposing sides in an international conflict agree on just one thing, a set of guidelines under which each may slaughter each other. This deems that killing in itself is perfectly OK, just as long as it is done under the agreed conditions. And, of course, by the winning side. The impossibility of applying such fractured logic is one of the central concerns of Bruce Beresford's extraordinary 1980 Breaker Morant, which was based on the true story of court martial of three members of Australia's Bushveltd Carbineers during the Boer War: Lieutenants Harry 'Breaker' Morant (Edward Woodward), Peter Handcock (Bryan Brown) and George Witton (Lewis Fitz-Gerald). Three specific charges were laid against the men, that they murdered a Boer commando named Vesser, that they unlawfully executed eight Boer prisoners of war, and that they assassinated a German missionary named Predikant Hesse to prevent him reporting the killing of the POWs. It was alleged that the killings were carried out in revenge for the slaughter by Boers of Captain Percy Hunt, a well respected leader and a close friend of Morant's. Whether the men are guilty or otherwise is of secondary consequence here – indeed, Morant never denied that he executed either Vesser or the eight POWs, but insisted that he did so according to standing orders from Lord Kitchener himself. Verbally relayed to Hunt, the orders were that no prisoners were to be taken and that any Boer caught dressed in British uniform – Vesser was caught wearing Hunt's own field jacket – should be immediately executed. There remains some disagreement and uncertainty to this day surrounding the true-life case on which the film is based, with some historians suggesting that Morant was a brutish killer and others arguing, persuasively as it happens, that he was the victim of political manoeuvring on the part of those in positions of military and political power. One of the very real strengths of Beresford's film is that he never paints Morant or Handcock in idealistic colours – the death of Hunt clearly has a traumatic effect on Morant and the execution of Vesser is shown very much as an act of anger-fuelled revenge. But we engage with the men anyway for the simple reason that, despite what they may or may not have done, the trial itself is clearly a Sham of the highest order. In a situation in which others are decorated for killing the enemy in often guerilla-style engagements, these three have been singled out for punishment as an act of political appeasement by those who are comfortably distanced from the fighting and emotionally disconnected from their plight. The film is impressively and seductively structured, built around the court martial and employing flashbacks to gradually reveal the truth or otherwise of witness statements. * An instant engagement with the characters is helped in part by their status as prisoners and victims of the system, which is brought home by the bumbling inexperience of their assigned defence lawyer, Major J.F. Thomas (Jack Thompson). That he comes across as out of his depth is hardly surprising – in civilian life he was a country solicitor who had never handled a court case of any description and his work was restricted to land conveyences and wills ("Might come in handy," jokes Handcock as all three of his clients react in disbelief to this news). To make matters worse, he has been given just one day to prepare for the trial, in contrast to the more experienced prosecutor who has had several weeks. As the four men walk to the improvised courthouse and Thomas stumbles alongside, asking last minute questions and dropping his papers, the picture of a doomed trio is most effectively painted. "Like this? Oh no sir, no, it wasn't quite like this. No, no sir, it wasn't quite so handsome! And as for rules... We didn't carry military manuals around with us. We were out on the veldt, fighting the Boer, the way he fought us! I'll tell you what rule we applied, sir! We applied rule 303! We caught them, and we shot them under rule 303!" 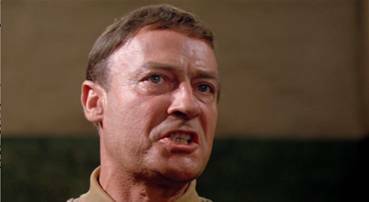 It's a rivetting sequence, electrified by Edward Woodward's fiery delivery, standing up and advancing towards the court officers as he barks the lines in a cinematically captivating act of defiance. It's also a neat trick in dramatic terms, cementing our alliance with a man whose actions we may ourselves disapprove of, but whose principled honesty is a lot easier to warm to than the stuffy hypocrisy of the court officials. This identification extends to all of the defendants, representative as they are of various aspects of the down-to-earth directness of the common soldiery, powerless victims in a class war against their British colonial masters. Morant commands the respect of those close to him through a combination of intelligence, artistic sensitivity (he was a published poet of some note) and no-nonsense leadership, Handcock is the bar-room brawler who you could nonetheless rely on to stand by you even when things were at their worst, and Witton is the sensitive innocent, unhappy with the executions but still loyal to his comrades and the aims of the war. It is this very loyalty that gives rise to one of the film's most extraordinary scenes, when the fort in which the trial is being conducted comes under surprise Boer attack and the three men are temporarily freed to help defend it. They fight bravely and effectively, only to have their efforts dismissed as irrelevant and Thomas's plea for their actions to warrant a pardon – as dictated by the Duke of Wellington – dismissed outright. All of which, once again, is depressingly true. As the case proceeds and Thomas's sterling efforts are repeatedly undermined by court inflexibility, restrictive interpretation of military law, and seemingly deliberate obstruction of his case, it becomes increasingly clear that the trial has little to do with justice. These men have clearly been selected for symbolic prosecution and possible execution for purely political reasons in a war that has become increasingly unpopular with the British public. 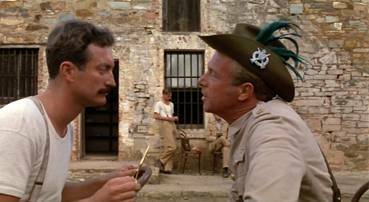 Despite the crimes committed on the battlefield, in Breaker Morant it's the British Empire itself that emerges as the bad guy. Performances across the board are superb. Edward Woodward makes Morant a commanding and compelling presence, his crisp delivery and bottled-up anger in the courtroom scenes contrasting wonderfully with his rage at the death of Hunt and the quiet, emotion-tinged poetry readings. Alongside his potrayal of Sergeant Howie in The Wicker Man and his breakthrough TV role as Intelligence operative David Callan, this is Woodward at his formidable best. Bryan Brown, whose popularity was close to peaking at the time of the film's release, is perfectly cast as Handcock, his repeated baiting of witnesses and down-to-earth resignation regarding the soldier's duties ("Well he'll never get to heaven if he doesn't die," he says as he joins Vesser's reluctant firing squad) giving the actor one of his best roles of the period. As defending council Thomas, Jack Thompson comes close to stealing the film, his disbelieving outrage at the obstructive behaviour of the court officials and don't-piss-me-about directness with his own clients make him a convincing opposition to the combined might of British military justice, and a man I'd certainly want at my side if I was in the soup. Although influenced by both Kenneth Ross' play Breaker Morant and Kit Denton's book The Breaker, the film feels neither overly literary nor remotely stage-bound. Handsomely directed, brilliantly edited by William Anderson (four times winner of the AFI award for Best Achievement in Editing, including for this film), it pulls off that rare trick of telling a dramatically compelling true story without ever wandering that far from the facts, right up to the emotionally stunning (and accurate) ending. Breaker Morant remains to this day one of the shining examples of the New Australian Cinema of the late 70s and early 80s, a beautifully executed and performed tale of injustice in an unjust world, and one that, as nations continue to do battle and place young men in positions of potentially abusive power then play politics with the results, is as relevant as it ever was. I have in my house a little corner known as The Cupboard of Shame, into which go presents and purchases that I wouldn't show even to my closest friend. Of the few but notable DVD inclusions there sits a PAL region 0 disc of Breaker Morant, put out some years ago by Prism Leisure. Although in the correct aspect ratio, the picture is otherwise pretty horrible, with no anamorphic enhancement and blighted by a blizzard of compression artefacts. The suspicion is that this was a port of the original Wellspring US release, but I've not been able to check this and word on that disc does suggest a slightly better transfer. Maybe it's all down to NTSC to PAL conversion. The depressing thing about such a release is that you know that there is little chance of an improved version for some time to come. But a couple of years later, Wellspring came to the rescue with this vastly improved, remastered print as part of their Masterworks series. Framed 1.85:1 and anamorphically enhanced, this is more like it. On the down side there is some very visible grain in some sequences that, as often happens, has been highlighted by the digital transfer, and the colour appears drained and the detail weaker in some of the night scenes, suggesting the use of a different (perhaps faster) film stock. But in all other ways the picture is very impressive – colour, detail and contrast are all very good, and black levels are strong. This is how the film should look. There are two soundtracks available, Dolby 2.0 mono, which is clear and spread nicely across the front sound stage, and 5.1, which is curiously confined almost exclusively to the centre speaker, and quieter. Go with 2.0. A couple of the features here were included on the original Wellspring and Prism releases. New to this edition is an Audio Commentary with Bruce Beresford, which despite some sizeable dead spots (they get longer as the film progresses) is a valuable companion to the film, providing information on the locations (Australia stood in convincingly for South Africa, even fooling a South African audience), the actors, the filming, and the historical truth behind key scenes. The director reveals that he is a fan of neither George Witton's book nor most of Morant's poetry (he likes the ones used in the film), and has a few interesting anecdotes, including the difficulty of casting the role of Witton (Lewis Fitz-Gerald was the only one who wanted it, and a young Mel Gibson turned it down for a role in a TV soap opera), and the ease of directing real soldiers, who proved good at following orders but tended to get into fights at night and turn up on set the next morning sporting a variety of injuries. A Bruce Beresford Biography provides a brief textual overview of the director's career. The Edward Woodward Interview (16:10) was recorded in 2000 and is a feature carried over from the earlier release. Woodward looks back warmly to his experience on the film, which he regards as one of the most enjoyable of his career. His strongest memory appears to be of learning to ride a horse to the level required by the story. The Original Theatrical Trailer (3:14) is framed 4:3 and some way from pin-sharp, though the colour has survived well enough. Real Life Character Breakdown provides textual background information on eight of the real-life characters from the film. This was also on the original release. There are selected Filmographies for the four lead actors and the director. Finally there is a very good Essay by Nick Bleszynski, author of the 2002 book Shoot Straight You Bastards – The Truth behind the Killing of 'Breaker' Morant, in which he examines how well the movie stands up in light of his research into the true story of the court martial. This is on the sleeve notes rather than the disc. 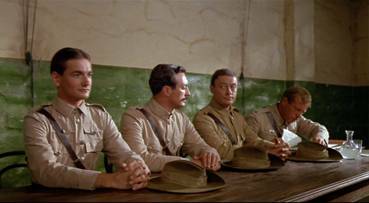 Breaker Morant is a wonderfully written, magnificently performed and compellingly filmed example of how to make great drama from a true story without unnecessarily embellishing the facts or fictionalising the characters. The Wellspring Masterworks edition disk showcases the film impressively, and is the ONLY version to own. Don't be tempted by bottom-drawer price deals on the earlier releases – it's just not worth it. * It is one of the happy accidents of the film's history that Beresford chose to structure it this way due to the low budget, just AUS$700,000, about £300,000.